Title page of the 1711 Amsterdam edition of the Ze’enah U-Re’enah. Courtesy Morris M. Faierstein. Find a .pdf version of this article here. The Ze’enah U-Re’enah 1 1 The transliteration of the title of Ze’enah U-Re’enah has taken many forms in bibliographic records, including but not limited to: Tsene-rene, Tsene-urene, or Tsenerene. Here, and throughout this text, the author has chosen to transliterate the title to maintain direct reference to the Hebrew spelling of the terms [צאנה וראנה]. is the most popular Yiddish book ever published, having been through at least 275 printings since its first, in the beginning of the seventeenth century. To date, two hundred and forty editions in Yiddish, and thirty-four full and partial translations, paraphrases, and summaries, in seven languages, have been identified. 2 2 A bibliography of all known editions can be found in my article, “The Se’enah U-Re’enah: A Preliminary Bibliography.” Revue des études juives, 172, 3-4 (2013): 397-427. The 275th edition is my English translation. Unfortunately, much of what has been written, both scholarly and popular, about this pivotal work is incorrect. This includes the definition of what the Ze’enah U-Re’enah is, the identity of its author, the title of the work, the educational profile of its intended audience, and its publication history. The recent appearance of the first complete critical translation of the Ze’enah U-Re’enah into English would be an appropriate time to reconsider and correct the facts surrounding this important work. The scholarly discussion of the evidence and more detailed documentation can be found in the Introduction to my translation of the Ze’enah U-Re’enah. 3 3 Faierstein, Morris M. Ze’enah U-Re’enah: A Critical Translation into English. 2 Vols. Berlin: De Gruyter, 2017 (Studia Judaica, 96), 1-27. 1. What is the Ze’enah U-Re’enah? The Ze’enah U-Re’enah is not a “Yiddish translation of the Humash written for women.” Rather, it is a sophisticated anthological commentary that draws on more than a dozen of the major medieval Jewish biblical commentaries and the whole corpus of Talmudic and Midrashic literature. Scattered throughout the work are also original comments and interpretations by the author/editor, Rabbi Jacob Isaac of Yanov. The title page of the earliest surviving edition makes this clear [see below]. 2. Who was the author? The author of the Ze’enah U-Re’enah was Rabbi Jacob ben Isaac Rabbino of Yanov. His unusual family name may indicate Italian origins. There are three cities named Yanov (Janova in Polish), but the consensus is that this is most likely the Yanov near Lublin. His birthdate is unknown, but we know that he died in the spring of 1623. Rabbi Jacob was an important rabbi during his lifetime, not some member of the “secondary intelligentsia” to whom Early Modern Yiddish literature is usually attributed. Aside from the internal evidence of the high intellectual level of his work, six of the most important rabbis in Poland issued an approbation for a work of his that was in progress, at a meeting of the Council of the Four Lands, in the spring of 1623. The Council met at the annual Lublin fair and conducted its business during the fair. The first two signatories were Rabbi Samuel Edels [Maharsh”a] and Rabbi Joel Sirkes [Bayit Hadash], authors of major Talmudic commentaries. The other four signatories were rabbis of cities or heads of yeshivas. That rabbis of this importance would issue an approbation for an unfinished work is eloquent testimony to the esteem in which Rabbi Jacob Isaac was held by the most important rabbis of the day. It is the conventional wisdom that the title of this work is Ze’enah U-Re’enah, taken from Song of Songs, 3:11, which is quoted in the title page. However, the phrase “Ze’enah U-Re’enah” is not the actual title of the work, but a subtitle. The correct title of the book is Ḥamisha Ḥumshe Torah ʻim kol ha-hafṭarot bi-leshon Ashkenaz [Five Books of the Torah in the Language of Ashkenaz]. 4 4 See n2 above for references. When one searches the card catalogs of major academic libraries, the Ze’enah U-Re’enah is cataloged under the title of Hamisha Humshei Torah be-Lashon Ashkenaz. Secondly, when the phrase Ze’enah U-Re’enah is examined in the larger context of the title page of the earliest edition, other possibilities present themselves. 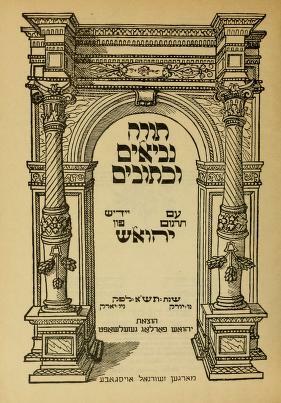 The title page is written almost entirely utilizing melizot, fragments of biblical verses used as a flowery way of expressing straightforward ideas, and talmudic references. It is noteworthy that the Midrash interprets the phrase Ze’enah U-Re’enah as a reference to outstanding young men. 5 5Song of Songs Rabah 3.11. The last Mishnah in tractate Ta’anit offers another interpretation of this verse that sheds additional light. Interpreting the last half of the verse it writes, “In the day of his espousals—this is the giving of the Torah; and in the day of the gladness of his heart—this is the building of the Temple.” 6 6 Mishnah, Ta’anit 4.8. The words of the author in his title page are perhaps the best illustration of his intentions and expected audience. The earliest surviving edition, Basel/Hanau, 1622 was printed in two volumes and had two title pages. The title page says that it was published in Basel, but the colophon and other evidence indicate that it was actually printed in Hanau. It is worth noting that the title pages are in Hebrew. Some books of this genre had Yiddish title pages, and others had bilingual title pages. With the crown that has crowned you,7 a living man of great deeds,8 with this wondrous work. He has gleaned among the sheaves behind the reapers 7 7 Ruth, 2:7. of grain, and collected after the gatherers, once up once down,10 one here and one there in the Midrashim, in the aggadot, in the words of Rashi, Ramban, Rabbenu Bahya, Hizkuni, Zeror ha-Mor, Toldot Yitzhak, and the other commentaries in every Torah portion, all of their words that are closest to the plain meaning of the text and brought them into this work in the language of Ashkenaz. Since the usefulness of this work for men and women who will find tranquility for themselves,11 a place of rest for their souls in order to understand the words of the living God,12 exceeding in rank and exceeding in honor,13 in the humble language. Before this appeared,14 it was already famous.15 It was praised in the city where it circulated, saying that nothing like this book was seen, incorporating the above-mentioned commentaries. Therefore, they shook out the bosom of their garment,16 with the aid of the Lord among the warriors,17 in the holy community of Lublin to undertake the divine task,18 bringing it to the divine work to reveal the hidden hoards,18 and concealed wisdom of this book. Afterwards, it was printed twice in the holy community of Krakow. Nonetheless, it is cannot be found in the whole diaspora of Ashkenaz, except for one from a town and two from a clan.19 This made it necessary to bring it to the craft of the press in the city of Basel. Printed with great deliberation and proofread with arduous deliberation, here in the city of Basel. The five Megillot and the Haftarot. In addition, the destruction of Jerusalem in Yiddish which was weighed and researched by the noble and pious Rabbi Jacob, the son of Rabbi Isaac, of blessed memory, from the family of Rabbino, who erected his tent and dwells in the holy community of Janova. He is the man who has already authored the five books of the Torah in Yiddish with nice midrashim and innovative interpretations. Since the mitzvah is not credited until one has completed it, he wonderfully did not rest from his labors until he also composed good explanations, midrashim, and innovative interpretations for the five Megillot and the Haftarot. Everyone who will see it will rejoice in his heart. Therefore, do not be concerned about the money and acquire this book to study and to fulfill everything that is written in it so that you will be worthy to see the building of the Temple. May the Redeemer come to Zion. Amen, so may it be. There is no need for speculation about the message the author intended to send about his intended audience with his allusion to the phrase Ze’enah U-Re’enah, if he intended to do so. He explicitly states in his title page that the intended audience for this work was “Anashim v’e nashim,” men and women. Certainly, in the seventeenth century, it was clear that men were also an integral part of the intended audience for the Ze’enah U-Re’enah. There is a tradition that one should review weekly Torah portion, twice in Hebrew and once in “Targum.” Normally, the term Targum is seen as a reference to the Aramaic translation of Onkelos. However, Rabbi David ha-Levi of Lvov [Lemberg], author of the most important Ashkenazi commentary on the Orah Hayyim section of the Shulhan Arukh, writes in his commentary that a man who is not fluent in Aramaic may substitute a Yiddish work on the Ḥumash, “like the Ze’enah U-Re’enah.” 8 8Ta”Z (Turei Zahav)on Shulhan Arukh, Oreh Hayyim, 265.2. The phrase, “like the Ze’enah U-Re’enah” is explicitly stated in the text of the Ta”Z. This passage not only shows that men were also considered a normal part of the audience for the Ze’enah U-Re’enah, but the importance and esteem in which the work was held already in the seventeenth century. Another related issue that is important and needs further analysis, is the level of knowledge expected of the intended audience. The first page of the 1711 Amsterdam edition is typical of early editions, from the beginning through the end of the eighteenth century. The first page of Genesis illustrates the issues facing the reader. Unlike modern works on the Bible, there are no chapter and verse citations. The commentary is not divided by verse, comment, or paragraph. It is one running paragraph that begins with the first word of the Torah portion and continues to the end of the portion in this fashion. Each comment begins with the first word or two of the sentence or phrase being commented upon. In some editions the vowel points are indicated and in others the words are unpointed. As a result, it is assumed that the intended reader has a sufficient working knowledge of the Ḥumash in Hebrew to be able to navigate the text. It also assumes that the reader knows the text of the Ḥumash, since the commentary does not translate or paraphrase the text of the Ḥumash. The numerous citations of texts and authors by name also imply some familiarity with these things. It is reasonable to assume that the author included them because he thought it would have some meaning to the audience. This level of allusion to texts and authors is commonplace in Early Modern Yiddish religious literature. 5. The Text and its Editions. 6. Yiddish religious literature and its latter-day detractors. Two other modern groups played a role perpetuating the myth of this literature as only for women. First are secular Yiddishists, Bundists, and Communists, who had anti religious ideologies and attaching the “women’s” label was a way of denigrating religious Yiddish literature. This was long before the ascent of feminism in the post-World War II era. With the rise of feminism, the narrative changed. Yiddish religious literature was now the source of a separate “women’s religion.” The literature on tehinnot or tkhines is a prime example. Yes, there are tehinnot written by and for women. However, there equally many tehinnot that are written for men or for a general audience that includes all ages and genders. Only by cherry picking and ignoring historical data can one construct a Jewish women’s religion based on Yiddish religious literature. In conclusion, the audience for the Ze’enah U-Re’enah, as for other Yiddish works of its era and type, was very broad, encompassing all who were literate in Yiddish. In other words, virtually the whole Jewish community of Early Modern Ashkenaz, male and female, young and old, from the barely literate to the most learned. The transliteration of the title of Ze’enah U-Re’enah has taken many forms in bibliographic records, including but not limited to: Tsene-rene, Tsene-urene, or Tsenerene. Here, and throughout this text, the author has chosen to transliterate the title to maintain direct reference to the Hebrew spelling of the terms [צאנה וראנה]. Zinberg, History of Jewish Literature, vol. 7, pp. 124-125. 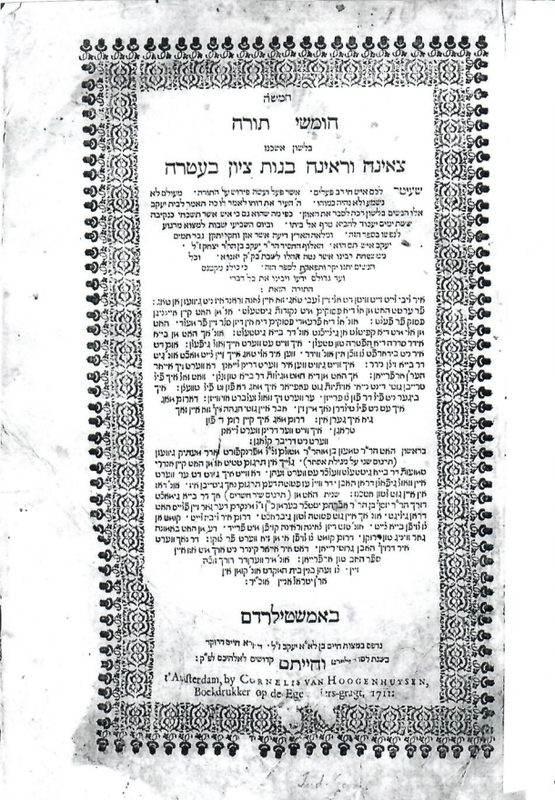 The list of seventy-nine title pages that Zinberg mentions are not found in the English translation of his work but can be found in the original Yiddish version of Zinberg’s history, vol. 6, appendix 4, pp. 330-332. Shmeruk, Chone. 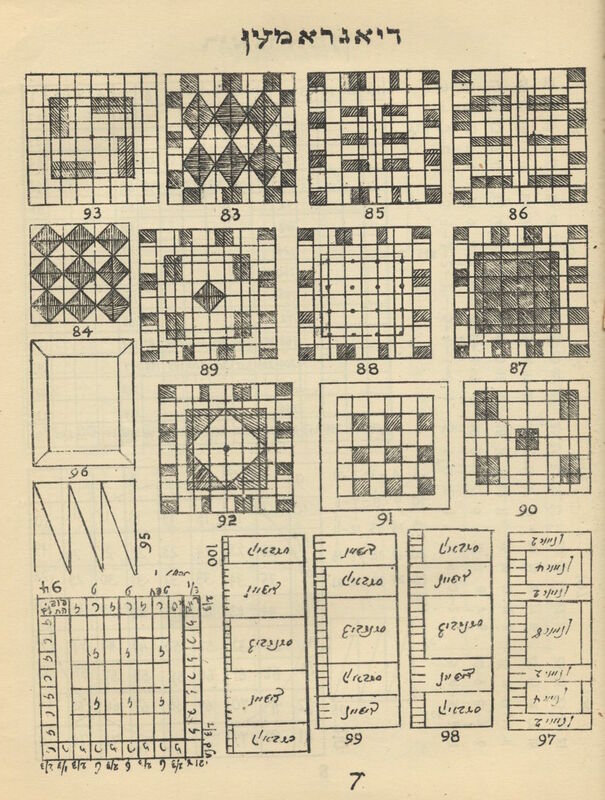 “The East European Versions of the Ze’enah U-Re’enah (1786–1850)” [Yiddish]. In, For Max Weinreich on his Seventieth Birthday. Ed. Lucy Dawidowicz, et.al. The Hague: Mouton, 1964, 320–336 [Yiddish section]. A Hebrew version of this article was published in Idem., Sifrut Yiddish Be-Polin. Jerusalem: Magnes Press, 1981, 147–164. Ta”Z (Turei Zahav)on Shulhan Arukh, Oreh Hayyim, 265.2. The phrase, “like the Ze’enah U-Re’enah” is explicitly stated in the text of the Ta”Z. A bibliography of all known editions can be found in my article, “The Se’enah U-Re’enah: A Preliminary Bibliography.” Revue des études juives, 172, 3-4 (2013): 397-427. The 275th edition is my English translation. II Samuel, 23:20; I Chronicles, 11:22. Song of Songs Rabah 3.11. See n2 above for references. Faierstein, Morris M. Ze’enah U-Re’enah: A Critical Translation into English. 2 Vols. Berlin: De Gruyter, 2017 (Studia Judaica, 96), 1-27. It was first published in Frankfurt am Main, 1705, and frequently reprinted, including many editions that were bilingual, Hebrew-Yiddish. Faierstein, Morris. “A Guide to the Ze’enah U-Re’enah: Correcting Some Misconceptions.” In geveb, February 2019: https://ingeveb.org/articles/a-guide-to-the-zeenah-u-reenah. Faierstein, Morris. “A Guide to the Ze’enah U-Re’enah: Correcting Some Misconceptions.” In geveb (February 2019): Accessed Apr 21, 2019. Dr. Morris M. Faierstein is a Research Associate at the Meyerhoff Center of Jewish Studies at the University of Maryland. 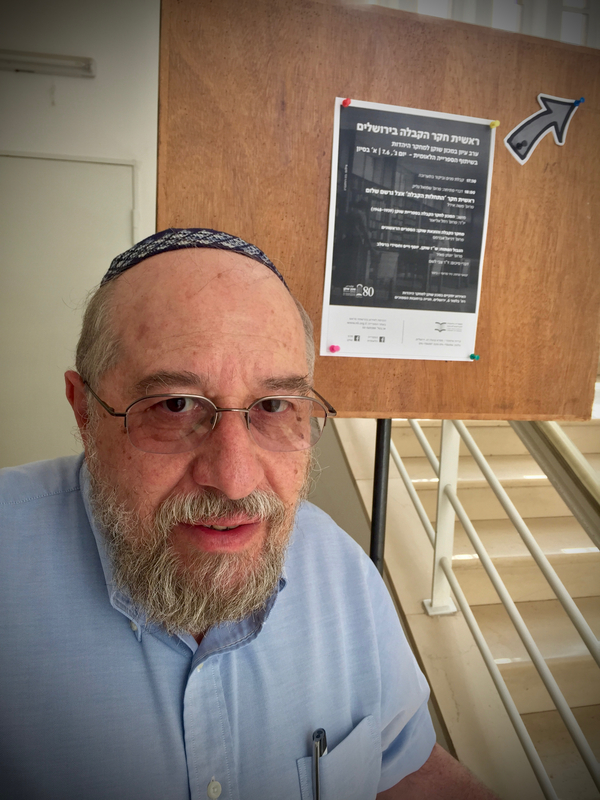 He has published twelve books and more than 125 scholarly articles and reviews in the areas of Hasidism, Kabbalah, and Early Modern Yiddish Literature. His books include The Libes Briv of Isaac Wetzlar, Yudisher Theriak: An Early Modern Yiddish Defense of Judaism, and The Ze’enah U-Re’enah: A Critical Translation into English.